Now in its 67th year, the Fort Collins Symphony under the direction of award-winning Maestro Wes Kenney is offering a season of delightful surprises, engaging programs, and stunning music. The Season kicks off on October 8, 2016 with a concert presenting pieces by beloved composers Rachmaninoff and Dvorak. Award-winning pianist and guest artist Xinyu Chen will dazzle as she performs the Rachmaninoff Piano Concerto No. 2. Northern Colorado’s talented professional orchestra performing striking pieces composed by Prokofiev, Bizet, Bernstein, Brahms, Mozart, Stravinsky, Beethoven, Sibelius, Bruckner and more! Highly acclaimed guest artists Xinyu Chen (previous Young Artist Competition winner on piano), Michelle Kim (New York Philharmonic Assistant Concertmaster), and Joe Alessi (Principal Trombonist for the New York Philharmonic). Marvelous Magical Movie Master, a Pops concert showcasing John Williams’s most recent scores and favorites from the past. Season ticket subscribers—both new and returning—who are unable to attend any of the 6 concerts may turn in their tickets to the Lincoln Center as a tax deductible contribution. Season tickets may be purchased online at LCtix.com/FCS-Season-Tickets, by phone at 970.221.6730, or in person at the Lincoln Center Box Office at 417 W. Magnolia. For more information about the upcoming season CLICK HERE or call 970.482.4823. 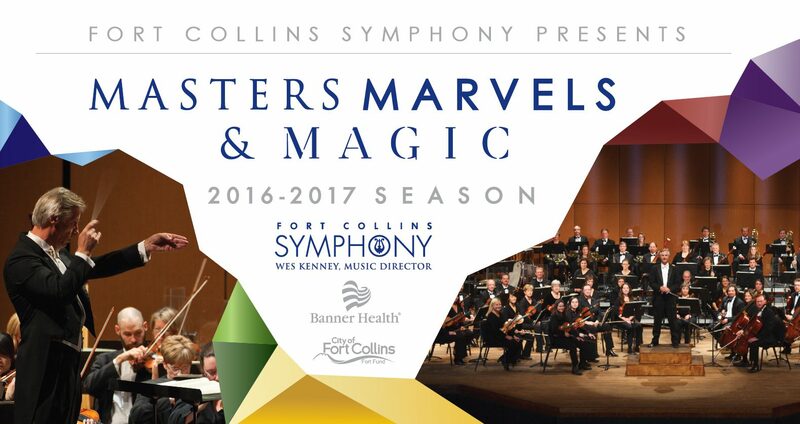 The 2016-17 Fort Collins Symphony Season is sponsored by Banner Health with additional support from the City of Fort Collins Fort Fund.